Normally in any given year I try to visit Scotland five or six times. So far this year I have been north of the border just once. I had had my eye out on a trip for a number of weeks, but the weather forecasts were insufficiently promising. However, during the week of 8th June a break in the largely dismal summer weather was promised, if only for a couple of days. So I packed up my gear and on Friday, 12th I drove north with Jet. Moidart is situated on the west coast of Scotland. 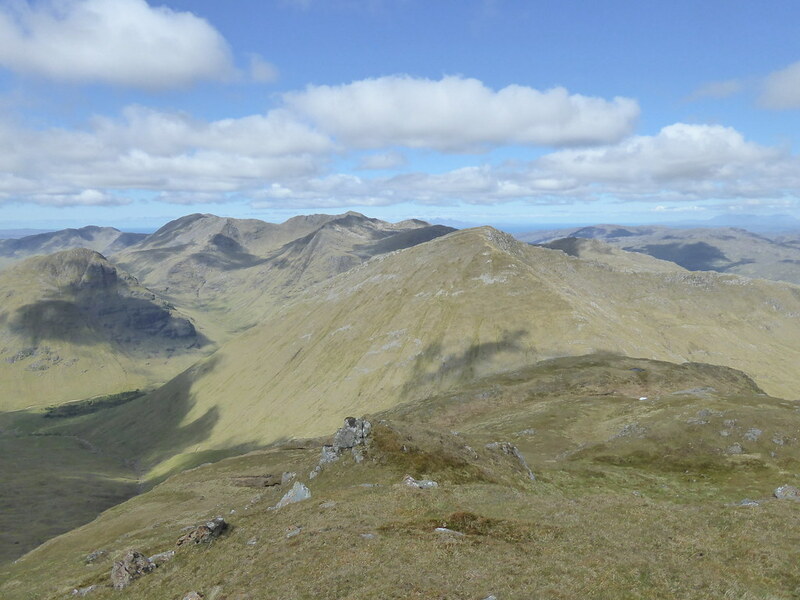 Because it does not have any Munros, it is less visited by hill-going folk perhaps than other areas in the Highlands. 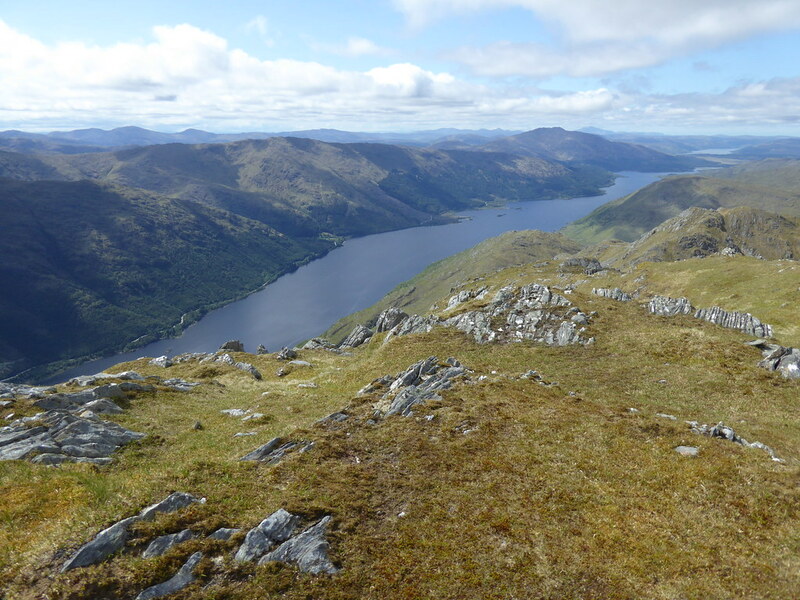 It also has a rough character, similar to Knoydart to the north. As the hills are less frequented, in many places paths have not begun to form from the pounding of feet. That said, it was summer so I did expect to see others. I had not previously explored Moidart. 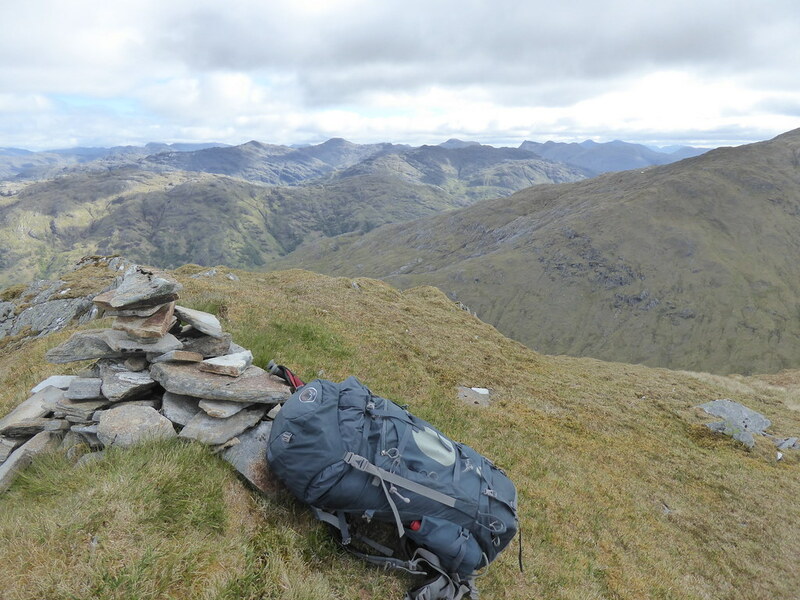 The plan was a two day walk with a wild camp at a point to be determined. Jet and I kipped in the car on the Friday night. Sleep was OK despite the short hours of darkness. I parked my car at Glenfinnan at the start of the route up two rugged Munros, Sgurr Thuilm and Sgurr nan Coireachan. Jet and I then walked up the road to Glenfinnan station. 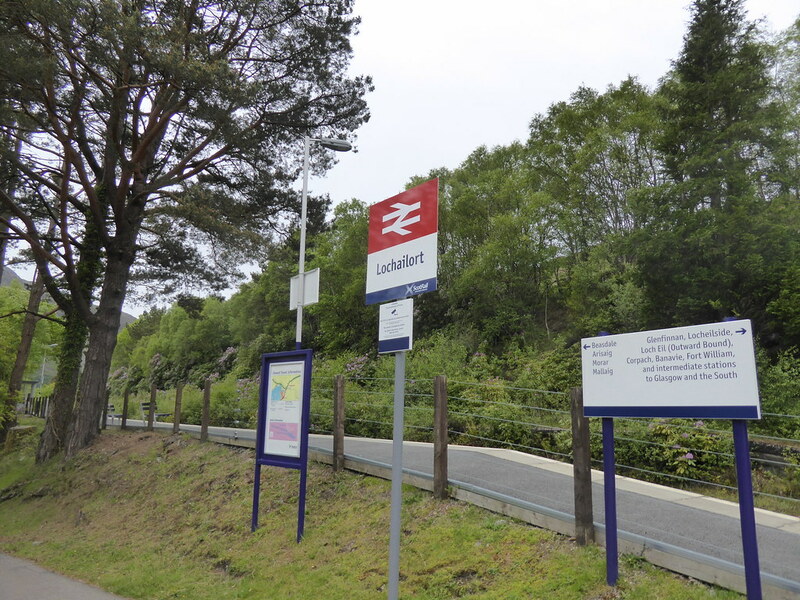 The plan was to catch the first train, go one stop (to Lochailort) and take a circuitous route back to Glenfinnan. We were there well before the train was due. Parked in the grounds of the station are a couple of old rail carriages, one comprising a restaurant and the other bunkhouse type accommodation. The restaurant was not open at that time – no chance of breakfast there then. There was some activity around the other carriage. As I was munching on some cereals bars for my breakfast, I saw a creature crossing the car park, it then hopped up some steps towards the platform. It was a pine marten. I could not recall ever having seen one in the wild before. Unfortunately, when it reached the platform, it saw me and Jet and turned tail the way it had come. I was too slow with the camera and failed to get a decent shot of it. Never mind. Here’s a shot of Jet instead – not looking forward to what was in store. The train duly arrived on time. By now Jet was on a lead so that he did not run off into the distant yonder when he saw the noisy, scary machine arrive. 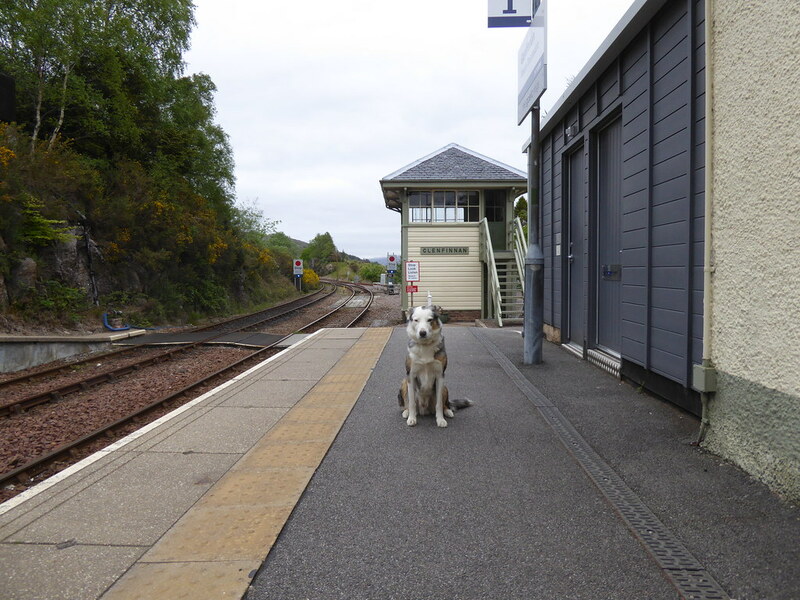 Jet has only been on one short return journey on a train before – between Tulloch and Corrour (also in the West Highlands). Then he was in a nervous state of high alert because of the strange noises and movement. Today was no different, tail between legs and conveniently lying in the middle of the aisle! The journey is short though, just 15 minutes or so. 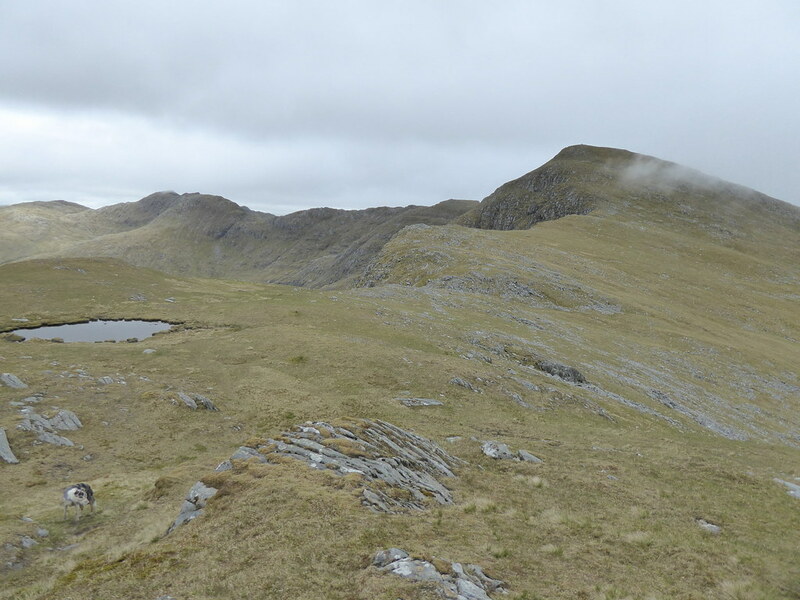 The route passes through some fairly wild country and by the remote bothy, Essan. The station at Lochailort is also not well used. It is a request stop so I had to ask the conductor to ensure that the train stopped there. It duly did. Jet and I were the only ones to alight. It was, as the Scots say, a rather dreich day. Clouds hung over the hill tops. It was damp and cool. The station is a little adrift from the village – not that there is much of the village. So we had to walk along the main road a little to reach a steep narrow road just before the pub that took us down to the river and over a bridge. Here we turned left to follow the river. There are some houses on the right before the grand house where a further right turn just beyond took us through a dilapidated yard. A couple of hundred metres beyond there was a split in the track not marked on my map. Off to the left was the start of a new track with a top of recently laid aggregate. The route I had mentally marked continued straight on along a wet grass track. I continued with my original plan following the grass track, still on the valley floor. To our right there was a fish farming hatchery humming with machinery. The wet path intersected with another wet path coming from the direction of Inverailort House, now sadly a ruin. Following this new path to the left over still wet ground, the path gradually rose on to drier terrain amongst scattered trees and followed what was presumably an old stalker’s path. The path climbed between the small hillock of Tom Odhar to the left and the bulk of my first objective, An Stac, to my right. An Stac was still 2½ kilometres away to the south and 800m higher. The path soon met a vehicle track coming up from the left. This was a continuation of the new track I had previously seen. As I was to find out, it had been bulldozed up the hill side to serve a new weir and probably small scale hydro-electric plant built into the Allt a’Bhuiridh. We followed this track for a short way before breaking off to the south west and on to the trackless slopes of Seann Cruach. The weather had not really improved, though the forecast suggested that it should do so by mid-morning. 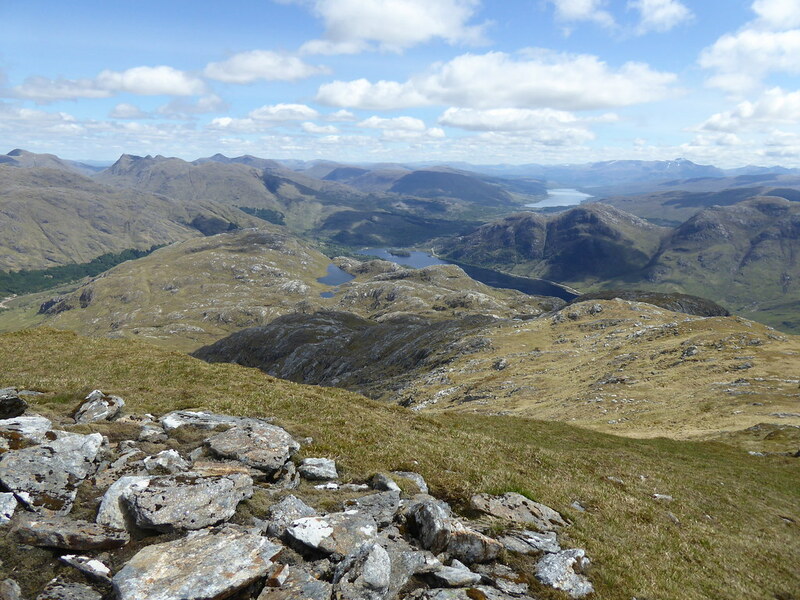 Here is a view back to upper Loch Ailort and part of the western seaboard from near the top of Sean Cruach. The way forward did not look promising. 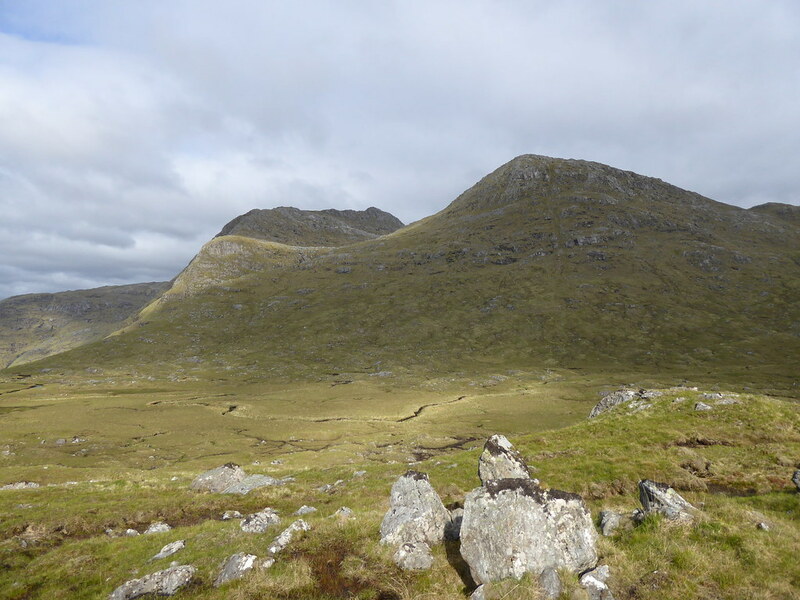 The upper shape of An Stac is like an upturned pudding basin. We duly entered the cloud and the driving drizzle. At the top was a couple. They had come up from Alisary on the coast road and were eating sandwiches. 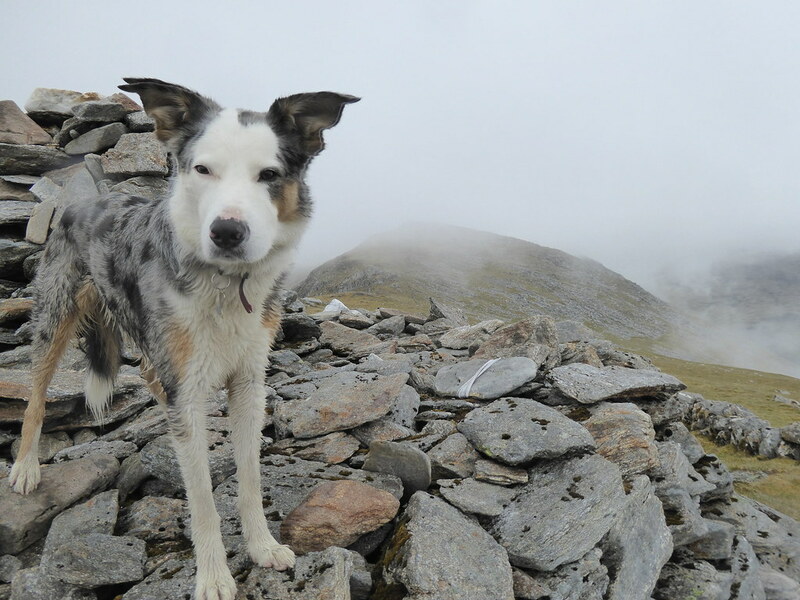 Jet, as ever, had reached the top before me, found the couple and given them the collie stare. The wife had succumbed and shared her food with Jet. The husband, quite rightly, had not! I joined them and had something to eat too. It was, after all, 1pm. They kindly took a picture of Jet and myself, but it was hardly worth it given the lack of background setting. It was time to move on. Jet and I left with the couple. Part way down I took a more direct, rocky route to the col. Here a wall comes from below on the right and provides a useful guide up the next objective, Rois-Bheinn, the highest of the three peaks I would be doing today. We had dropped out of the cloud on the way down. 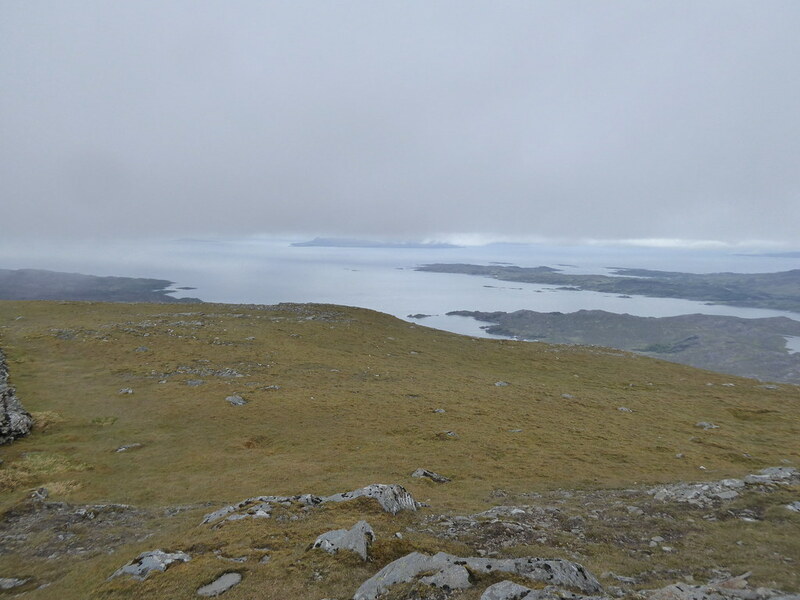 The cloud was definitely lifting and breaking, but Rois-Bheinn’s upper reaches were still covered. Part way up I took this shot looking back at misty An Stac, the wall and a bit of sea. The wall continues all the way to the summit and beyond. The trig point marked on the map is no longer there. In the cloud I decided to go on beyond the first cairn (which was the summit) and on towards the western top. This is 750m further on and supposedly a better viewpoint – though that benefit was doubtful today! It also has a substantial built cairn. It was now 3pm. 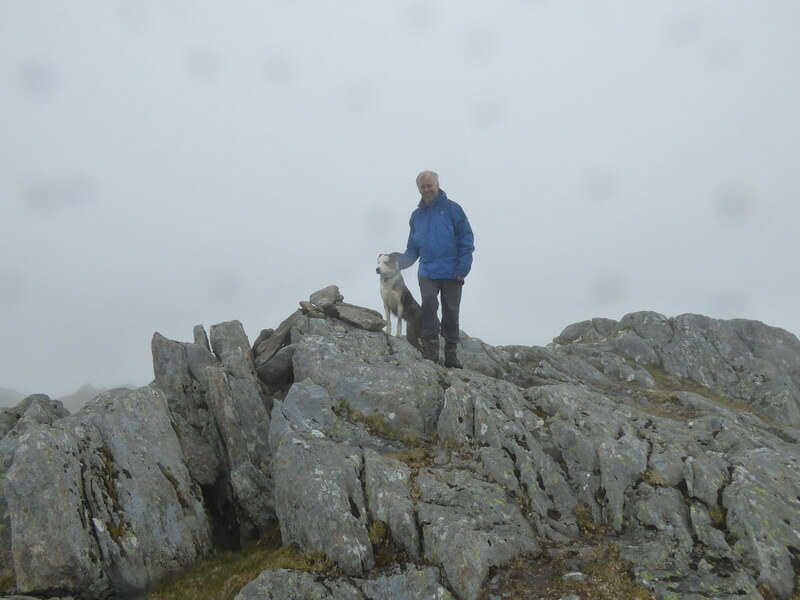 Jet and settled down in the lee of the cairn in the hope that the clouds would finally lift and we would get a view. A short while later a lone man arrived. He was doing my route in reverse. We had a brief chat and he was off whilst I still waited for the view. Eventually we sort have got one. 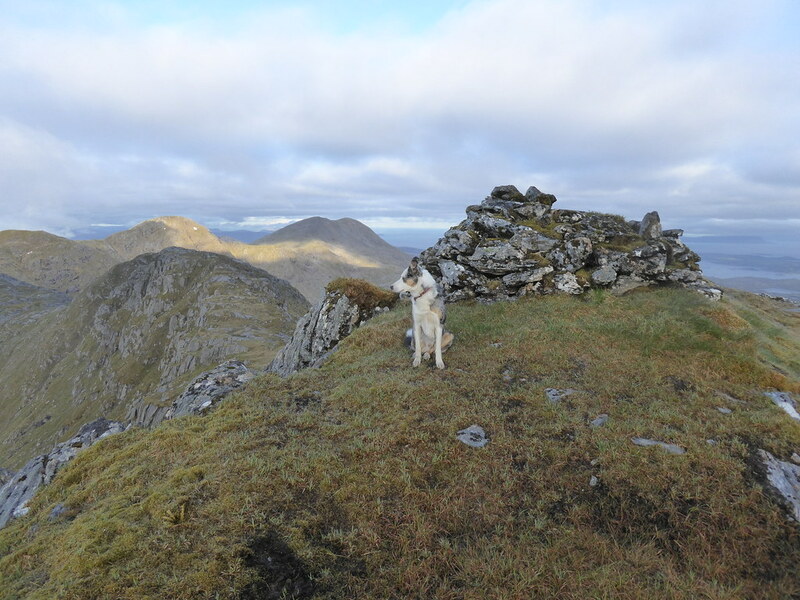 Here is Jet on the cairn with the main summit in the distance. And here is one looking to the coast. So we then returned to the main summit. Here is the cloudy view back to the west summit. As we started the descent, the clouds finally parted – only around three or four hours after forecast! So here was a view back to An Stac. On the descent I passed the couple whom I had met on An Stac. And one on to the final peak of the day, the tongue twister Sgurr na Ba Glaise. A pool on the col marked the point at which we would leave the wall. As ever, Jet was keen to explore the water. 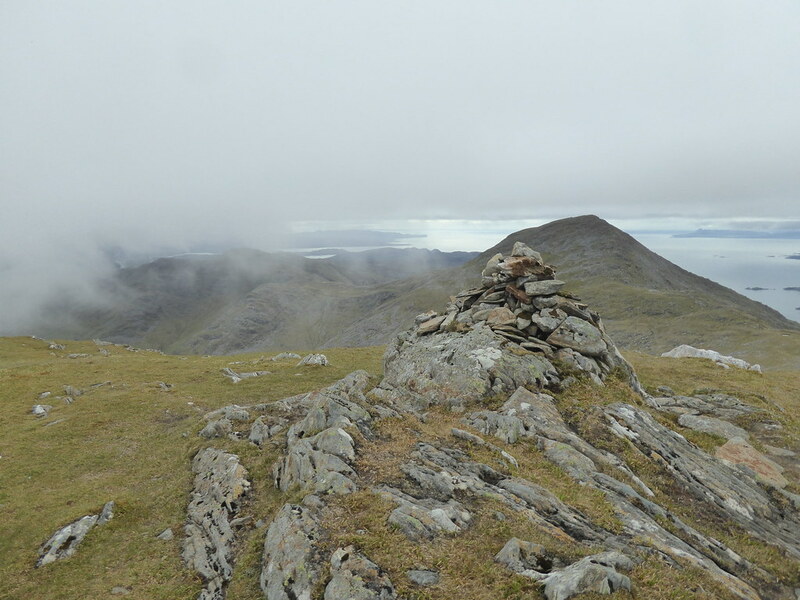 The rise to the cairn on Sgurr na Ba Glaise was straightforward. But time was marching on. It was now 4.25pm and I had to find a place to settle for the night. 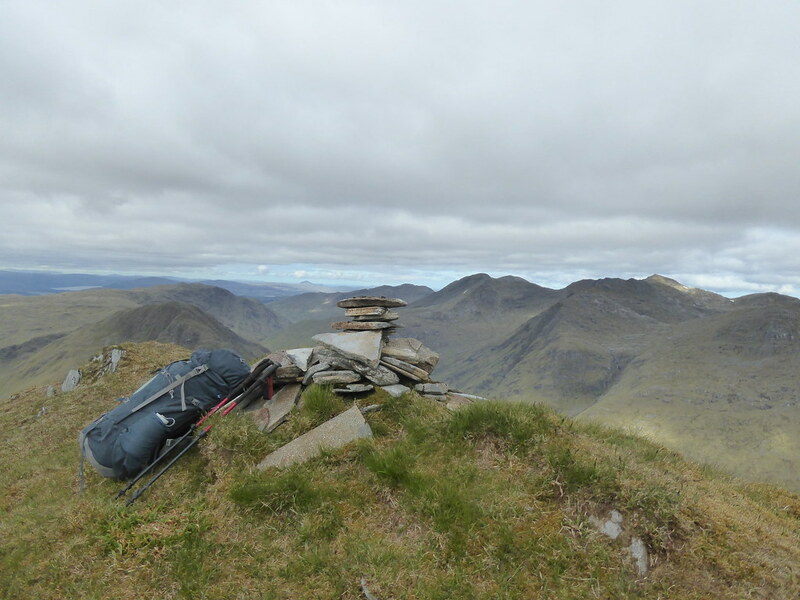 Here was the view over to An Stac from this summit. I now had to work my way east. 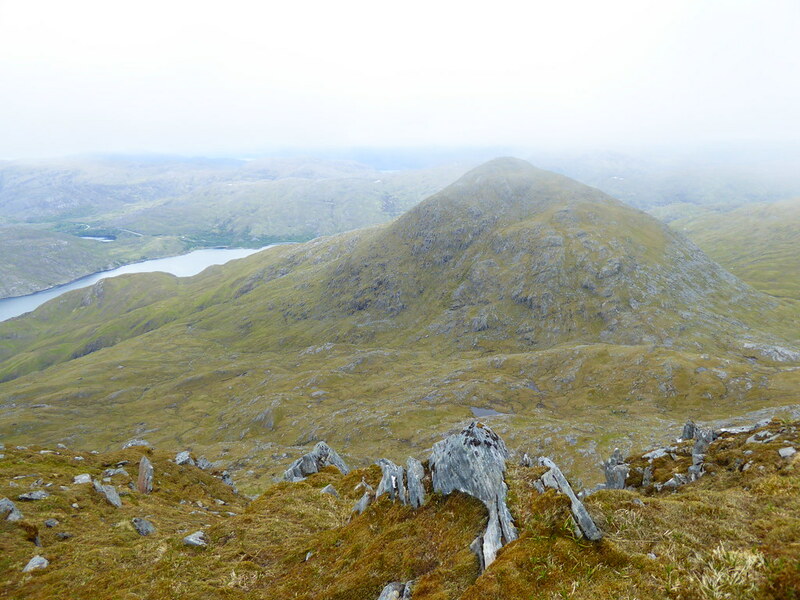 The ridge off Sgurr na Ba Glaise is twisting and full of ups and downs. It is interesting for all that, but I was now starting to tire, a combination of the heavier pack and yesterday’s drive up. The ridge also has lots of lochans some with suitable camp spots nearby. But I wanted to make a little more progress. The largest of the lochans was at the east end of An t Slat-bheinn. I was very tempted to stop there. I pressed on. 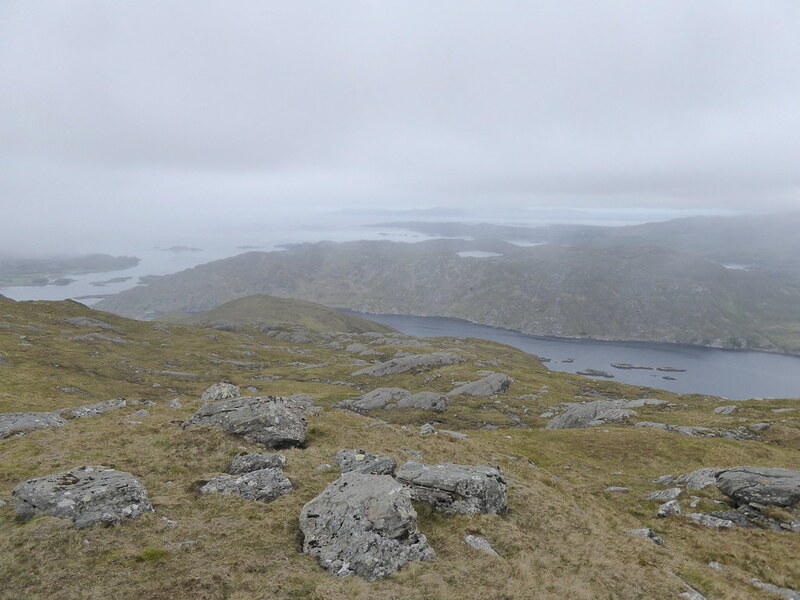 There was then a 50m drop to another col and then I had to grit my teeth for a 120m climb up on to Druim Fiaclach. 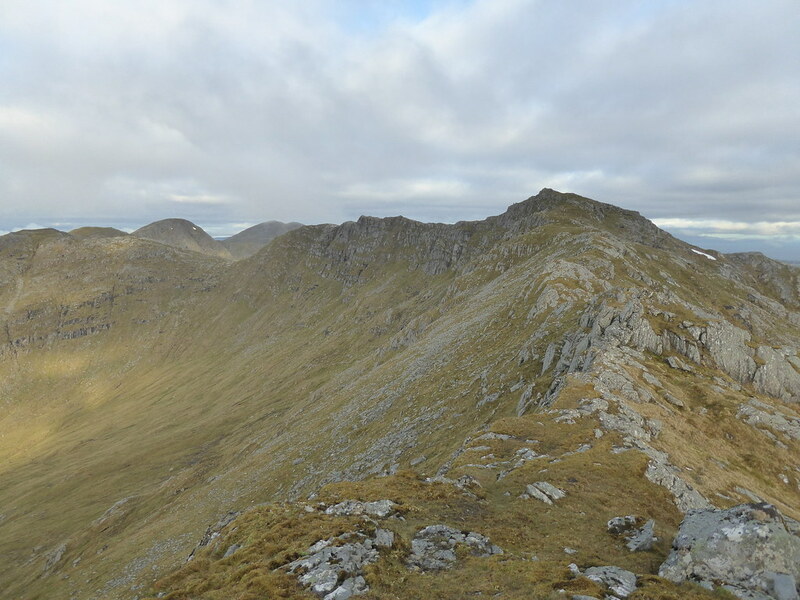 But first here is a pano of the view back to Sgurr na Ba Glaise. 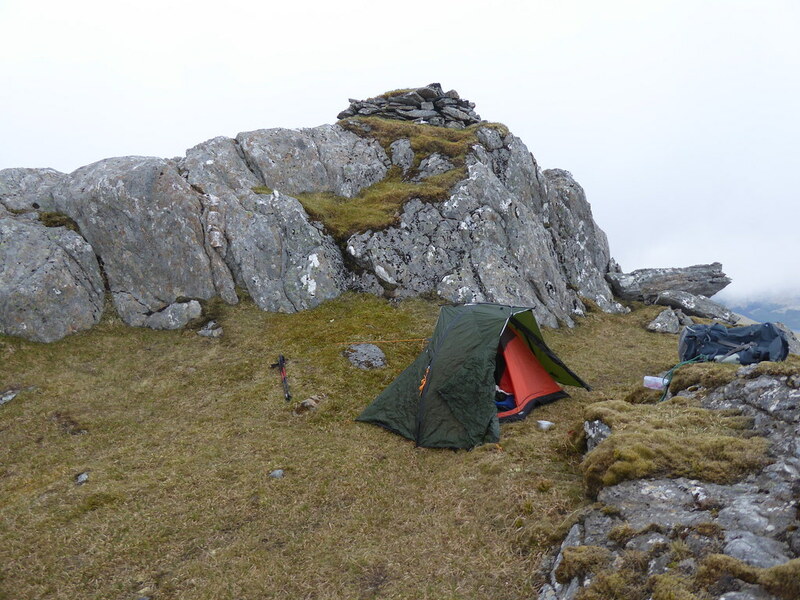 As I had hoped there was a sufficiently level place just below the summit cairn on Druim Fiaclach for me to pitch the tent. I would be camping at 860m. Having quickly sorted the tent, I then equally quickly sorted out my meal – cooking al fresco with three layers on my top. For whilst the weather was benign, it was chilly. I was also able to lighten my load by giving Jet his evening meal. Just as I was finishing my meal and washing up the pots it began to rain. So I dived into the tent and called Jet in with me. The timing was good because the rain came down with some force for a while. Anyway the two of us settled down and, as usual, Jet sought to displace me from my sleeping mat! So it was an early night and equally early wake up with the sun. At times in the night I had heard rain but it was dry when I peeked out of the tent at around 5.30am. I let Jet out and then prepared some porridge for myself. Here is a pic of my three hills of the day before with the sun catching the tops of two of them. I packed up and looked at the map to remind myself of today’s route. 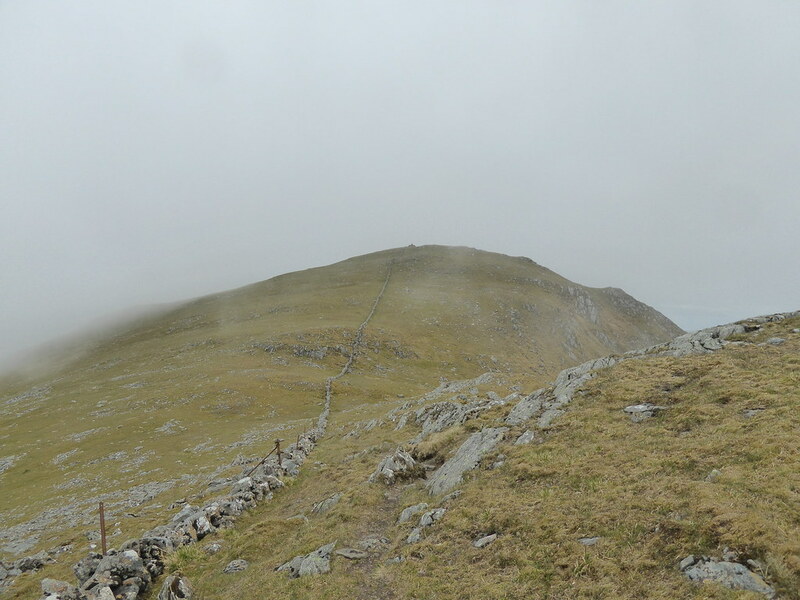 The first section went along Druim Fiaclach’s east ridge. This is a ridge full of interest, not narrow but with rocky obstacles lying across it. It might be tricky getting Jet over or around them. But first a shot of Jet sitting by the summit cairn at 6.30am as we set off. 25 minutes later I was able to look back along the ridge. Generally it had been OK for Jet. Where necessary there had been ways around the obstacles. In just one place I had to keep careful control over Jet, going part way up a scramble and then hauling him by the scruff of the neck up to a little platform. Here he turned around and licked me. I would like to think that it was a lick of gratitude! I joined him and directed him up a further narrow section and then all of the difficulties were over. 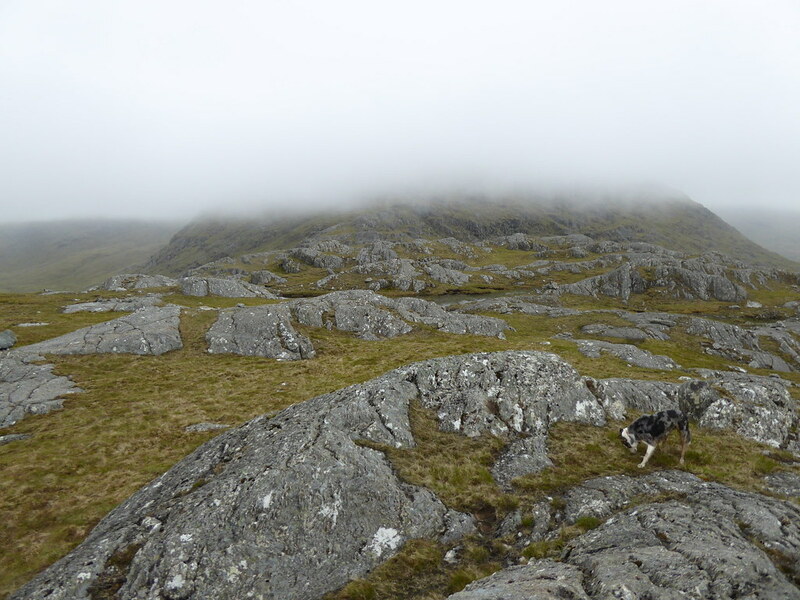 It is not that usual that one begins the day with a ridge walk and then a long descent. 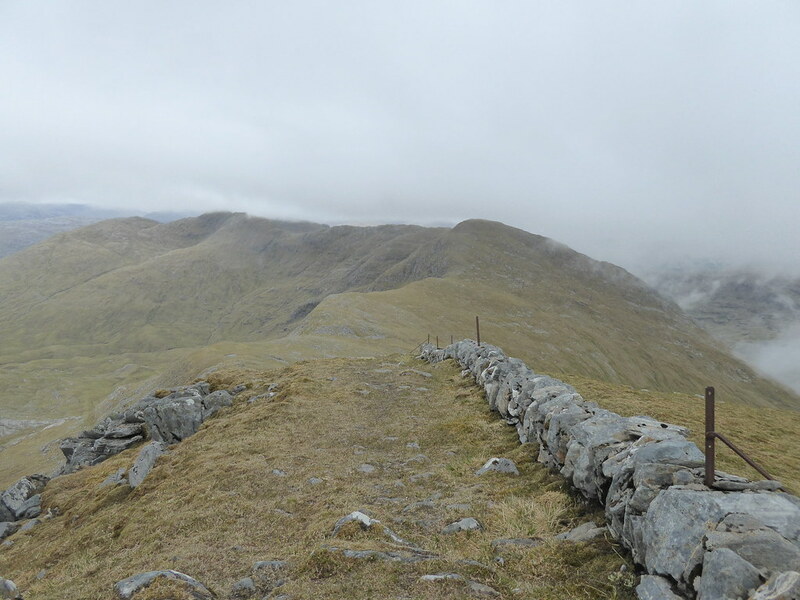 But before the end of the ridge, we peeled off towards the col with Diollaid Mhor and then traversed that hill’s lower slopes before descending again to the broad glen between that hill and Beinn Mhic Ceididh. The ground in the glen was not that wet. Just before starting up Beinn Mhic Ceididh, I had a second breakfast. Here was the view back the way we had come. There was then a bit of a grind up the steep slopes ahead of me. It took about an hour to ascend 450m. The summit is unremarkable, but there were nice views. Here is one to the north and the Glenfinnan hills. One back to the hills of the day before. And one to the way I was going. It was 9.20am. Looking down the north ridge I could see someone coming up. I thought to myself that he or she must have started early. I left before he/she arrived. The next target was Beinn Odhar Bheag. This meant descending to below 500m, followed by another 400m ascent. Just before I reached the foot of the descent the individual (a male) caught up with me. It was the solo male whom I had met on Rois-bheinn the day before. He had gone back to his holiday accommodation the previous evening and then made an early start from Loch Eilt. We chatted for 15 minutes or so as we walked on, but on the rise I suggested he go on ahead as I was more heavily laden. Meanwhile the clouds were dissipating and it was becoming pleasantly warm. I must admit that the climb was a bit of a toil. The slopes were uniformly steep to 750m and then eased. 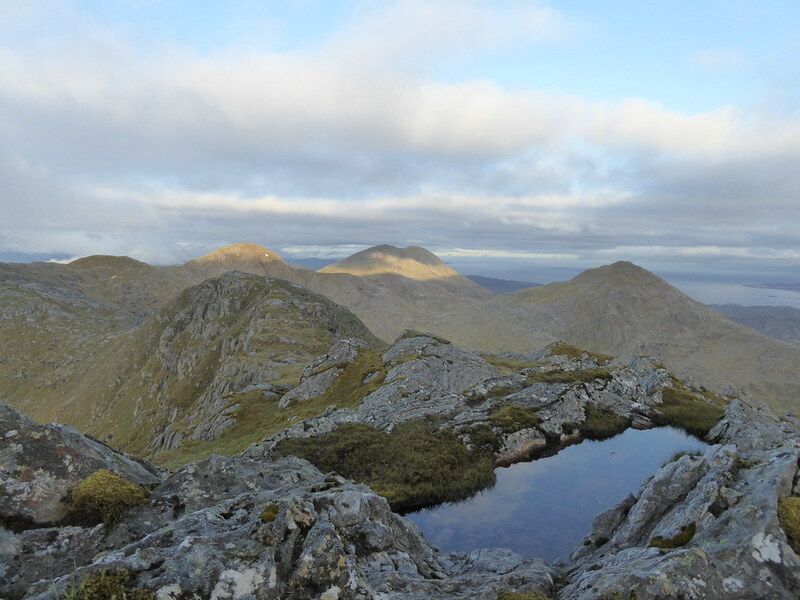 There were then views to Beinn a’Chaorrain and Beinn Odhar Mhor, the outliers of Beinn Odhar Bheag. 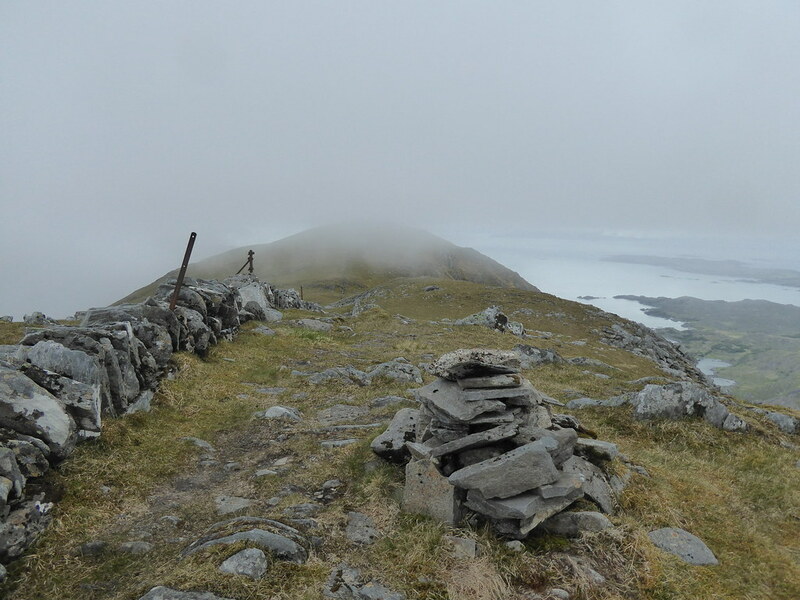 As I approached the summit I could see the guy I had been speaking to leaving for Beinn Odhar Bheag, the way we would be going. I stopped briefly to take this photo back to the hills we had climbed over the past two days. By 11.15am we were at the top. The views here are simply great. Especially those down on to Loch Shiel. I watched as the solo guy made his way up the slopes to Beinn Odhar Mhor. It was nice in the sun but I felt the pressure of time bearing on me. I was planning to drive back home the same day. So I reluctantly tore myself away. Again the ridge is a little bumpy but there is a path along it. 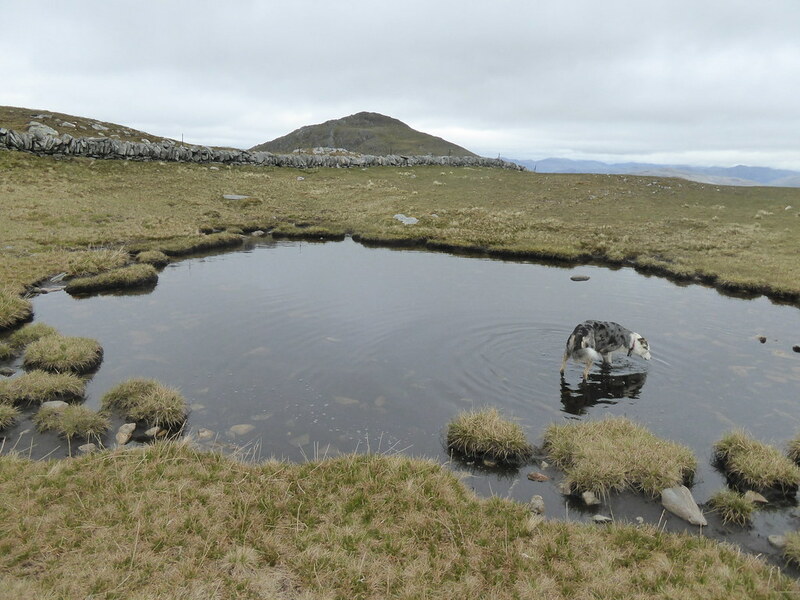 It was 12.30pm by the time Beinn Odhar Mhor and its trig point were reached. The views here were as good. And here is the route down towards Glenfinnan. 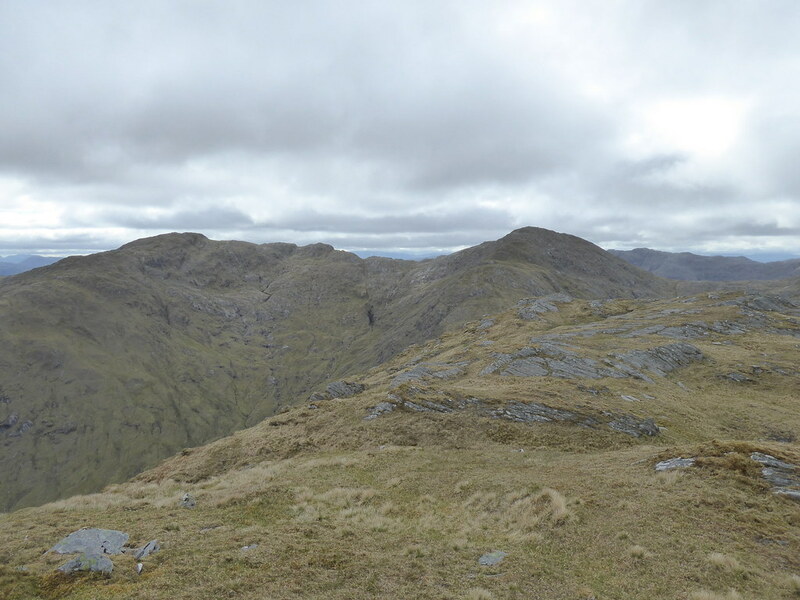 And back to Beinn Odhar Bheag with the previous hills of this trip to the right. So I led us first down the east ridge and then towards point 529 as shown on the OS. Near here a choice had to be made. 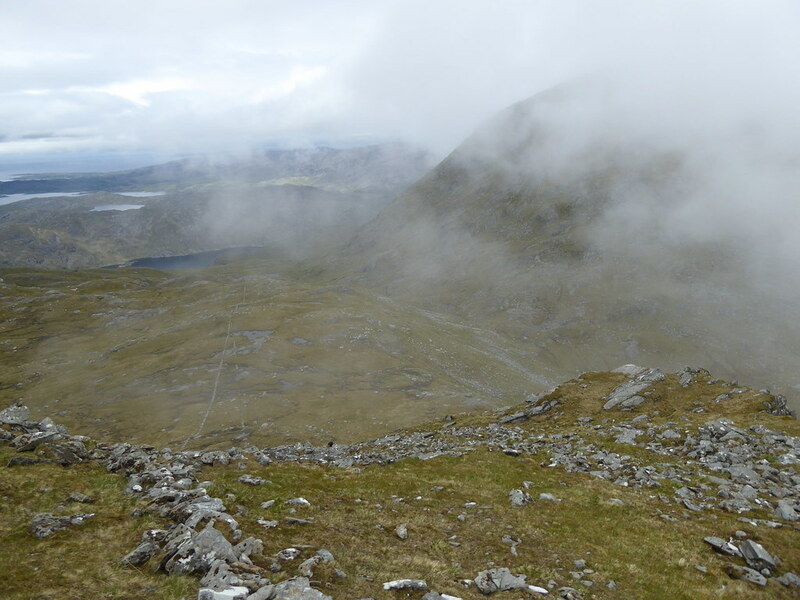 Either we could descend direct to Loch Shiel and hope that there was a path along the shoreline. 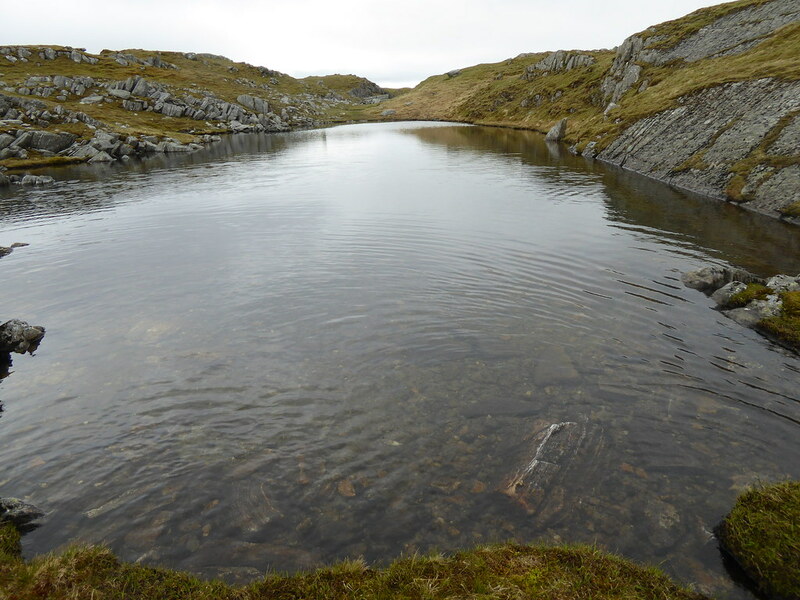 Alternatively we could make our way towards Lochan nan Sleubhaich and see if there was a path from the outflow. I chose the former. I am not sure that it was the right decision but I will never know because I have not experienced the alternative. The slopes down to Loch Shiel soon became covered with bracken which both obscured the ground so I could not easily see what I was walking on and also attempted to trip you. Jet did not seem to have any trouble, though he was infested with ticks in the section. And whilst I did find a path of sorts, it was rough, up and down and intermittent. Where headlands had to be avoided the path rose and crossed wet ground before descending back to the lochside. Respite was had at two attractive beaches that we passed. But there were a lot more trees than shown on the map. And just when I thought reaching the road at Slatach was in sight I was met by a fence. By this time I did not care so I climbed it and found a way for Jet under it. The land was poached so I expected to find some animals. There were a couple of horses. They were inquisitive but no more. But Jet was spooked. Eventually he found a (no doubt) circuitous route to avoid them. We were then met with the grounds of a house or the alternative of scaling another fence into the forestry. Being a scaredy cat I plumped for the forest. I had to lift Jet through (yes through) the dilapidated fence. I then battled through branches and wet runnels until I saw a gate to salvation. But I could not open it. So I pushed Jet and rucksack under the fence and then proceeded to climb 3 metres or so over the fence. I flopped gratefully over the other side and proceeded to the vehicular track there and it was then 500m into the village and a further 500m to where the car was parked. I removed my rucksack and then a small twig that was stuck in my hair. Jet had been able to drink in Loch Shiel but I was now a bit dehydrated. So I spent a few minutes glugging down some water. It was time to set off. I need to go back to Moidart and Ardgour, its neighbour to the south. It is a part of the world neglected by me despite all of my visits to Scotland. 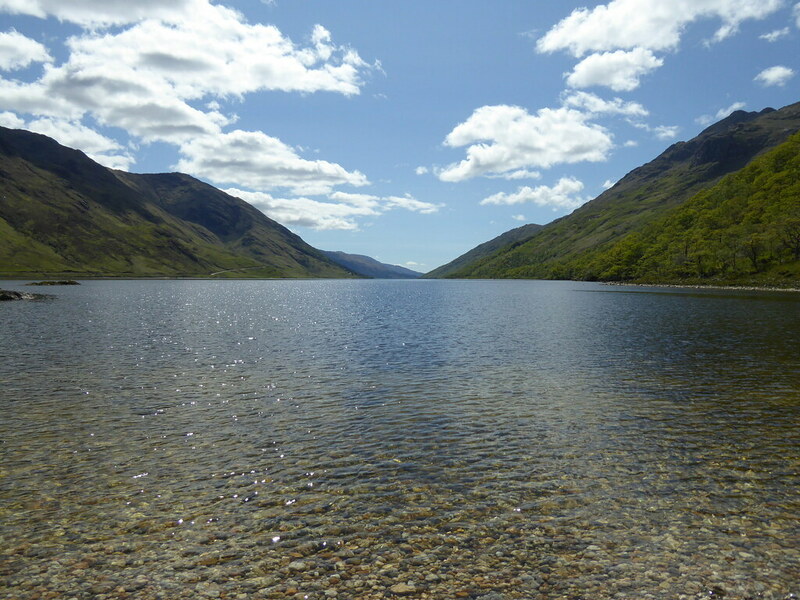 Apart from the nightmare of returning along Loch Shiel it was a great route through country where one does not meet many people. The hills are rugged but not difficult, the scenery is wonderful. 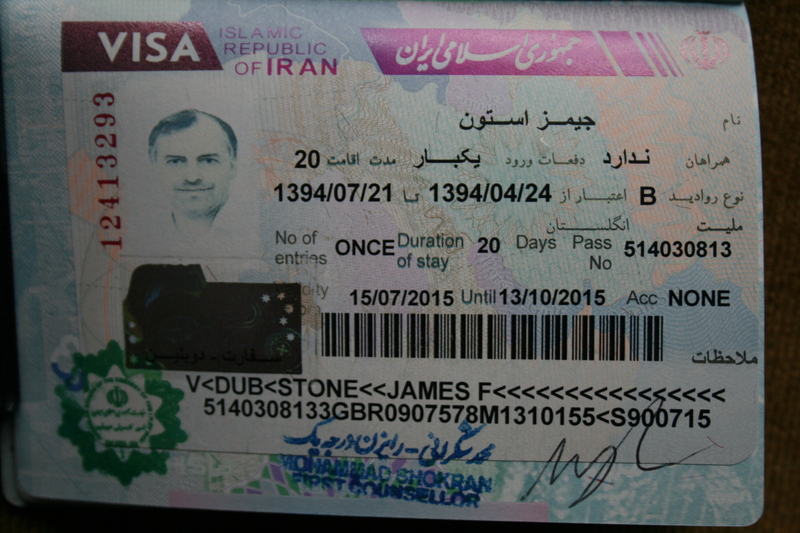 Well – I am back from my Iranian adventure! I am pleased to say that I managed to climb Damavand, the highest mountain in Iran and the highest volcano in Asia. I will write further blogs describing the trip, including photos and, perhaps, videos over the next days and weeks. 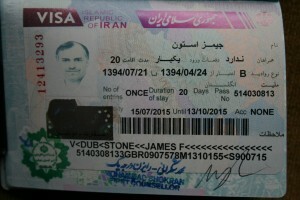 Although obtaining the visa to enter Iran was a little stressful, hopefully the bureaucracy will ease now that the political deal over nuclear development in Iran seems to have been done. Iran appears to be a country with much potential. The people we met were invariably friendly and curious. Now might be a time to visit before the tourist industry fully develops. So, if you are thinking about it, do something about it!